The actors in Colonial Williamsburg seldom break character, but this charming gentleman smiled as I laughed out loud. I was wondering what he would think if I told him I wanted it not to warm my seedlings but to join a fun cloche party! Bell glasses are used in all the gardens in Colonial Williamsburg to keep the seedlings warm on cool evenings. Green glass is often preferred, but I have not been able to discover the reason. 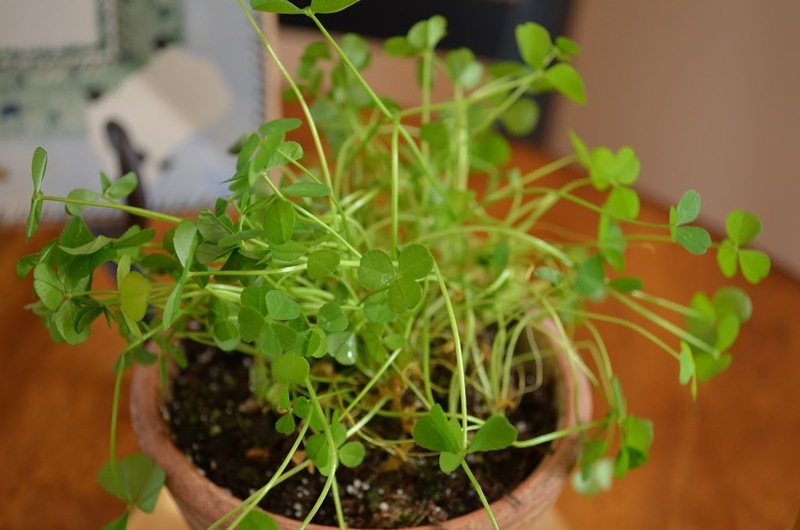 These “shamrocks” being sold at my local store look suspiciously like the clover I pull out of my lawn. But under the cloche they appear quite dainty and exotic! covered in wild Irish roses. 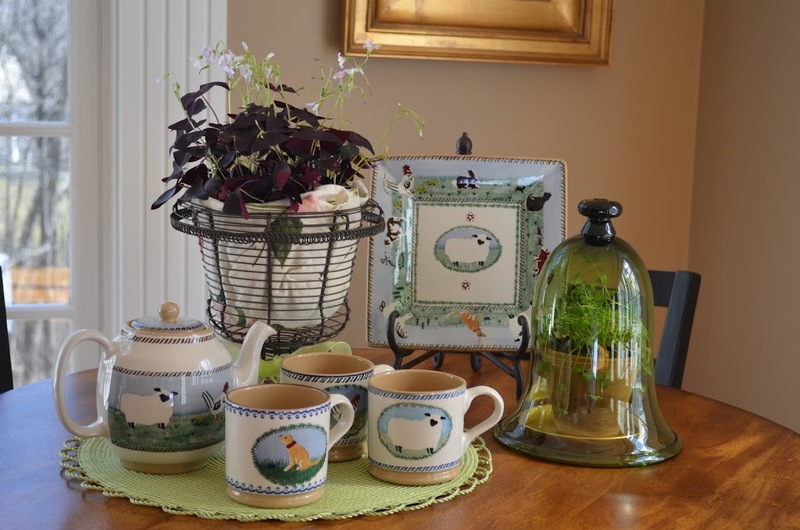 and Irish Afternoon tea tastes especially delicious in my Irish Nicholas Mosse pottery. 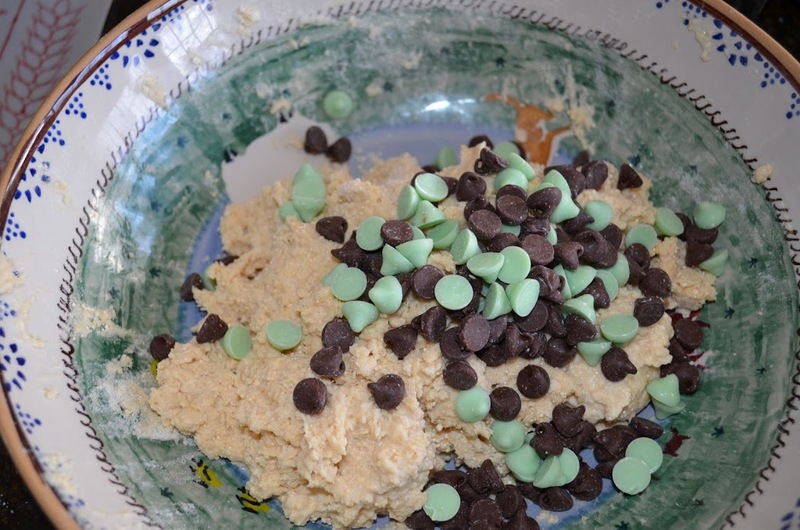 My Irish scone recipe calls for a “fistful of currants” but I say why add fruit when there are mint chocolate chips in the pantry??? Mmmm. Look at that pure Irish butter melting on the scone! so I quickly slammed it down again. I did manage to get the little fellow’s pot of gold. Next → Next post: Let’s Dish With Portmeirion and Tulips! I love all the cloches and I love your story. We had supper at Campbell’s when we were there. It was so much fun, as the lady of the inn did not break away from her character. Hi Linda. 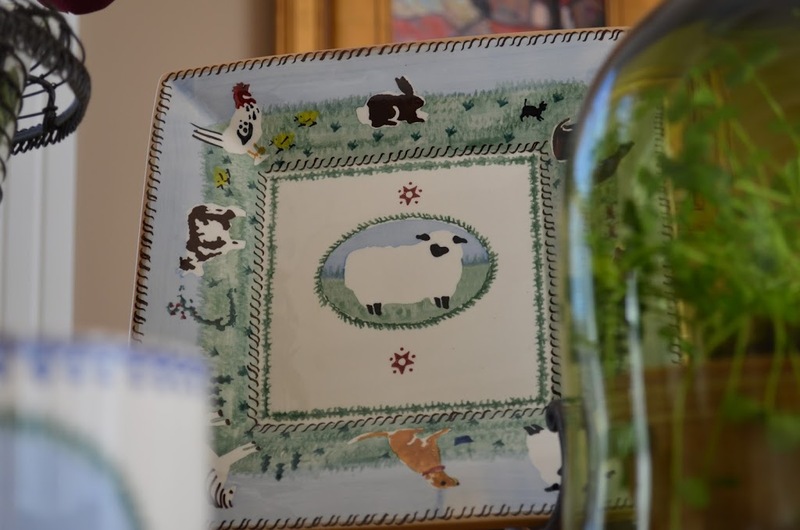 Love your green cloche and those precious dishes! Oh Hi Linda, I’m so happy I found you, again. Glad to have you back posting and no wonder, this is a fabulous post. Love how you explain the difference between the bell jar and a cloche! 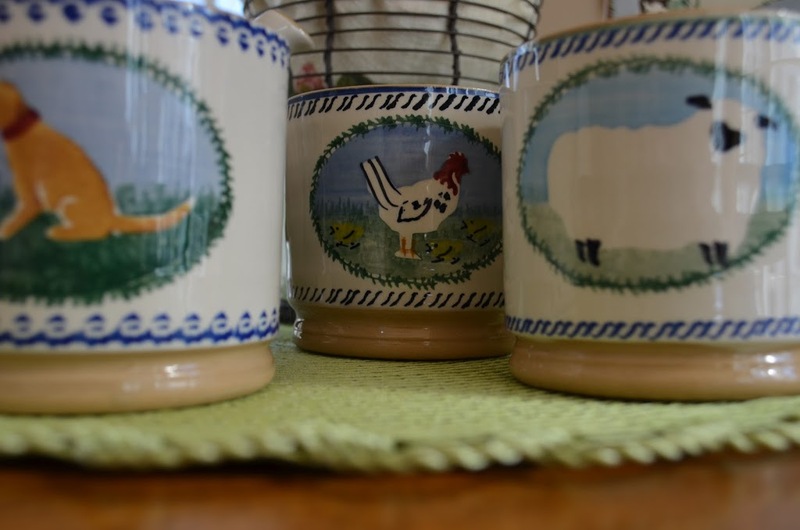 I love, love, love your Nicholas Mosse pottery. I had it in my hand and didn’t buy it! Next trip I won’t make that mistake. Love the vignette with the pottery and cloche. Oooh – I love the green bell jars too! 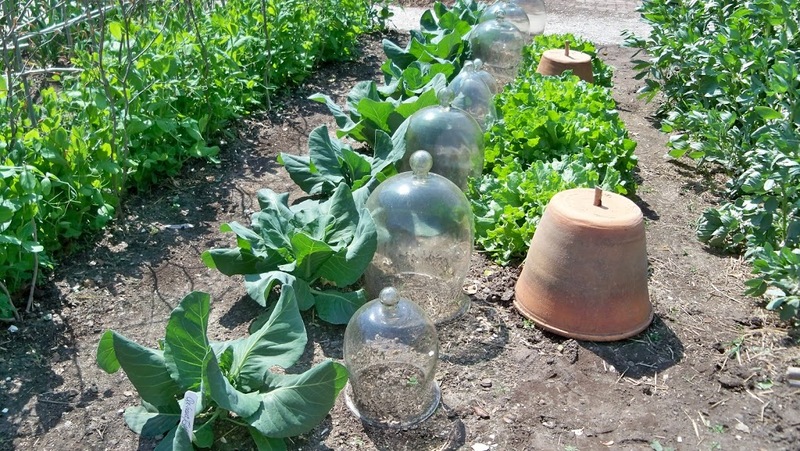 So interesting what cloches were originally used for. Too bad you couldn’t catch that leprechaun! I love your cloche, ummm I mean bell glass! I have a green vase I got there at Jamestown several years ago. They make them right there. I believe the green is a color that comes out naturally from the sand they use there? Anyway, having a green one is totally cool! 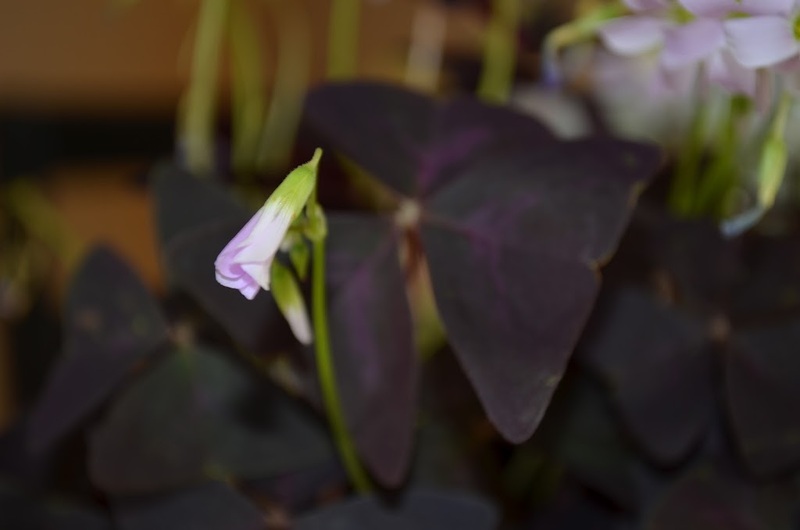 Love your shamrock plants! Love your Nicholas Mosse pottery! Looks like you are all ready for St Patrick’s Day! A green cloche…that is interesting….I really like it…and of coursem, the green is perfect for St. Patty’s Day!! OOO, Linda Lou, I LOVED this post. You have some really pretty Irish pieces. The only thing I have that is actually from Ireland (my friend brought it back to me) is a ceramic shamrock. When I got ready to do my post, I could not find that shamrock ANYwhere. Maybe a little leprechaun made off with it. This is a wonderful post. You write very well. I read every word. Made me want to visit Williamsburg again and pick up a bell jar. Happy St. Patrick’s Day. Your vignette and your cloche are beautiful! Wonderful post! I love your cloche, Linda! I don’t think I’ve ever seen one in a colored glass before! I wonder if they used them to absorb the heat for the plant, but keep the actually sun from hitting it, where it might burn the plant. It’s the perfect color for this time of year! SO pretty! Such a wonderful post. I enjoyed it. Happy St. Patrick’s Day. The scones look delicious! Linda, this is just delightful! I knew the term “bell jar” long before I learned of “cloche” LOL Your green one is especially pretty. 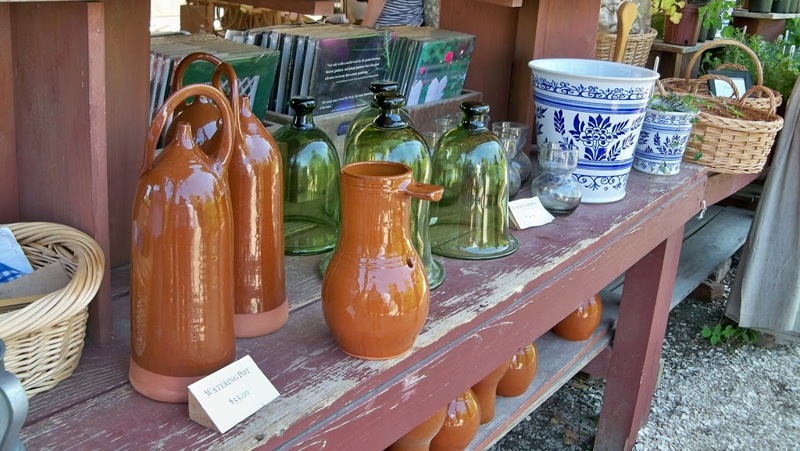 I am not familiar with Nicholas Mosse pottery…must go google it & learn more. Thanks for sharing all your pretties! What beautiful photos! Thanks for commenting on my blog. I am your newest follower! Stay Green! Love the green cloche. I’ve never seen one. Linda, I loved your post!! 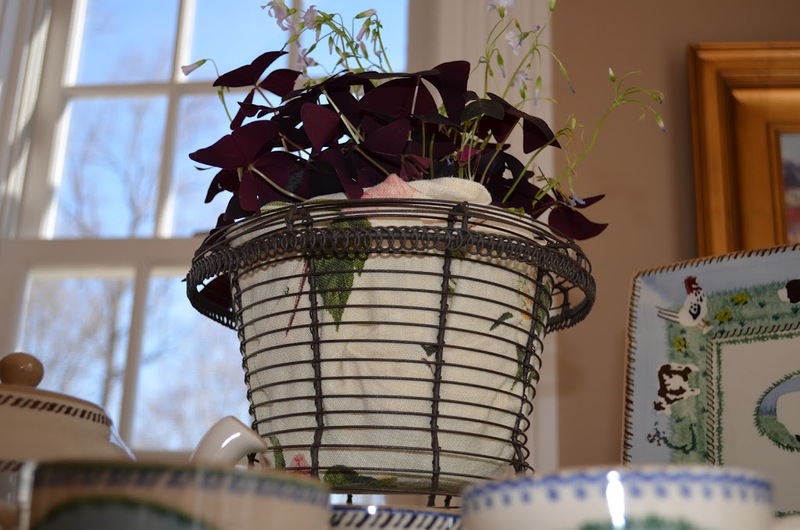 Your cloche is so pretty and your pottery….I’m swooning!! 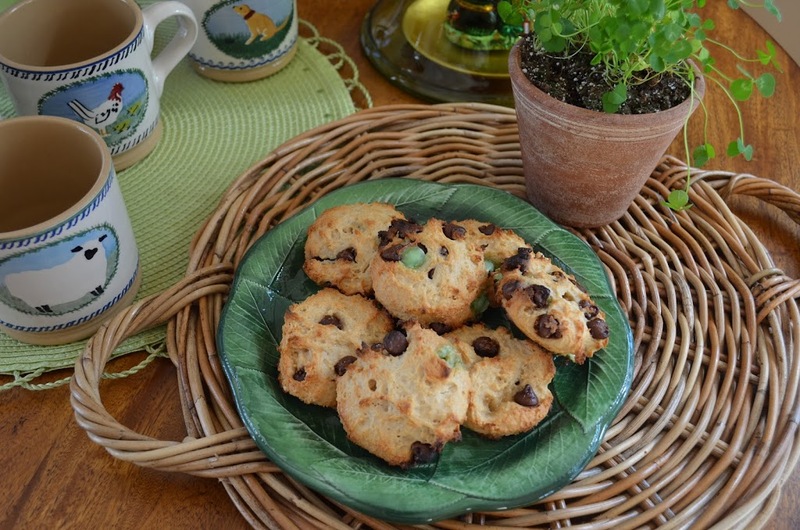 You made a perfect St. Pat’s Day treat with the scones and tea….yum! Linda, I only have one wee cloche (the big ones take up too much room), but I would find a spot for that green one! 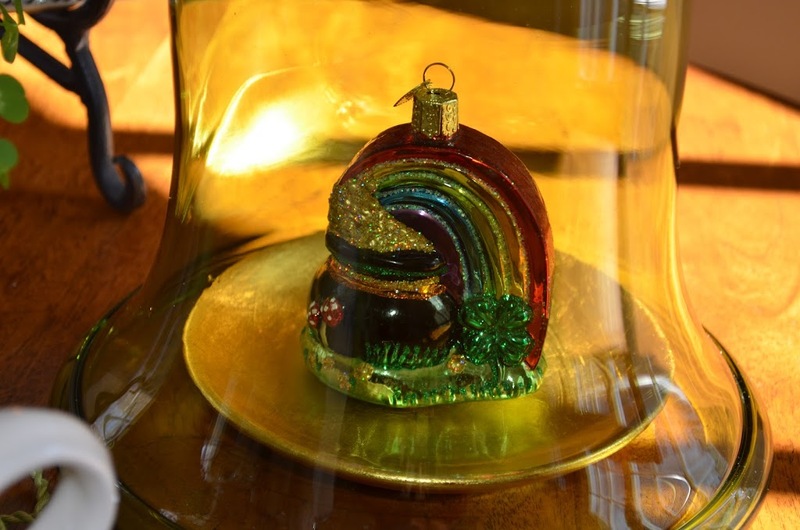 I love your pot of gold ornament. This is such a fun post. 🙂 I love everything on your table. 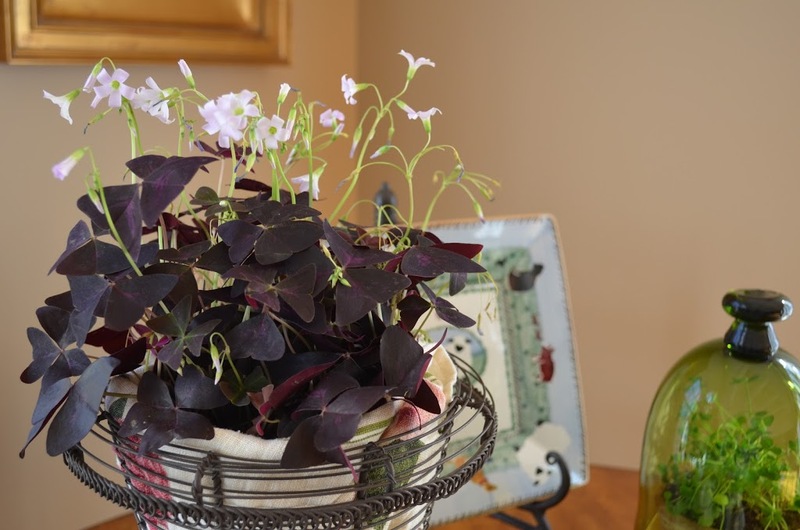 I’ve always loved shamrocks; I used to always keep one in my home. I enjoyed your cloche/bell jar story. Williamsburg is a great place to visit, and the green cloche is really pretty. I’m so excited to see your Nicholas Mosse pottery! I saw some years ago when we were in the U.K., but I never see it around here. It’s so charming and unique! Thanks so much for visiting my blog and for your kind comments. I’m now following your blog on Google Friend Connect. Hope you have a great week! Charming tablescape, LOVE the green bell glass! WHat a treat to visit Williamsburg! Happy SPD! I’m your newest follower. It’s such fun to make new friends!! I forgot to tell you that we went to Williamsburg on our honeymoon. I was in that very spot in Williamsburg recently too. Love your cloches and how you wove the story was so enjoyable. So clever and creative. 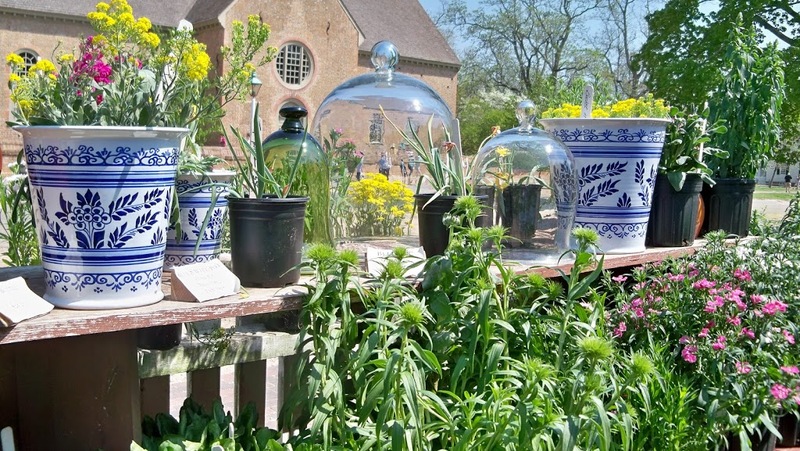 I was going to blog about the garden at Monticello (they also have cloches) but you beat me to it. I have a book on antique garden ornaments you would like. I think I did a post on it in 2010. I think it was the first cloche party of Marty’s I joined. I always look forward to her parties. Love your green bell glass and those precious dishes! Stopping by for a visit from the blog crawl! Your cloche is lovely! I have to say I think it’s the first green one I’ve ever seen! You have many lovely Irish treasures. Happy St. Patrick’s Day! Love Williamsburg and Jamestown and your green cloche! That ornament would look great on my ornament tree! I emailed you about fascinators!!! Linda, Alma and I had scones at an Irish Coffee House we went to a few weeks ago. They were like sawdust! I finally found a good recipe, nice and moist! Love your bell , I don’t use mine in the garden either! The green cloche is gorgeous, LInda! If I ever go back to Williamsburg, VA, I will look for them. 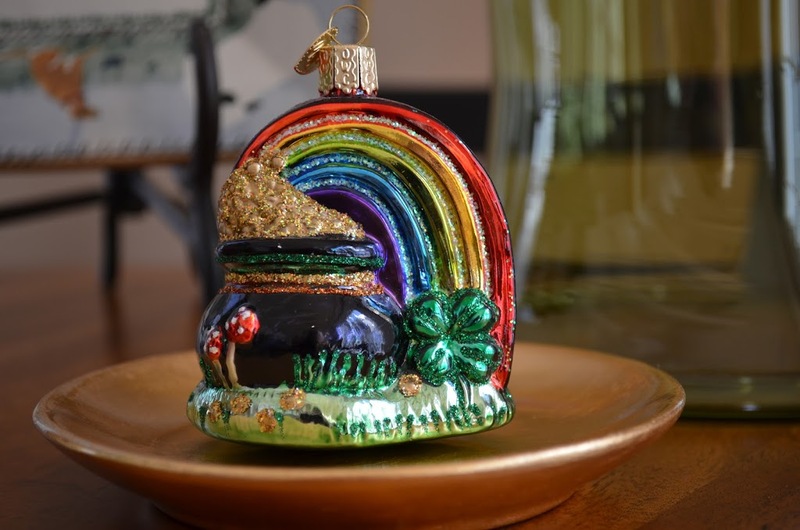 The pot of gold is perfect captured inside of it for luck! 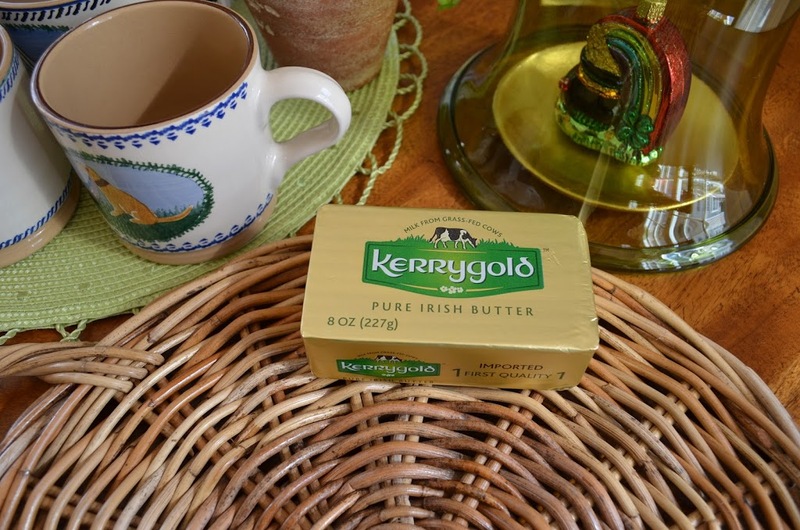 Your scones look delcious and I agree, Kerrygold is the best tasting butter there is. What a nice post, enjoyed it! Rettabug sent me an easy sounding recipe for corned beef and cabbage, I’m thinking about trying it. Here’s her recipe if you would like to try it too. Let me know if you do! You should try doing a corned beef in the crock pot. It is SOOOO easy & extremely flavorful that way. You just put 1/2 cup H2o in the bottom, rinse off the meat & lay it with the fat side UP, sprinkle on the little package of seasonings & add 1 or 2 chopped onions over it all. Put the lid on & don’t open it for 8-10 hrs. & I promise you, it will be the most tender & flavorful CBeef you’ve ever had. I did it this way last year & will never boil it again!! Hi Linda~ I’m in love with your green bell jar too! Perfectly delightful!!!!! In every way!!!!! those green cloches are fantastic! Bell glass or cloche, they are all just fine and I love seeing all the ways they are used. Your green cloche is beautiful you are so luck to fine this great color, and those precious dishes! I would like to thank you so much for your sweet comments on my new post. Hope you have a wonderful St.Patrick’s Day with your family. How fun! Love your green cloche! Perfect for shamrocks. Linda, I so agree with you. 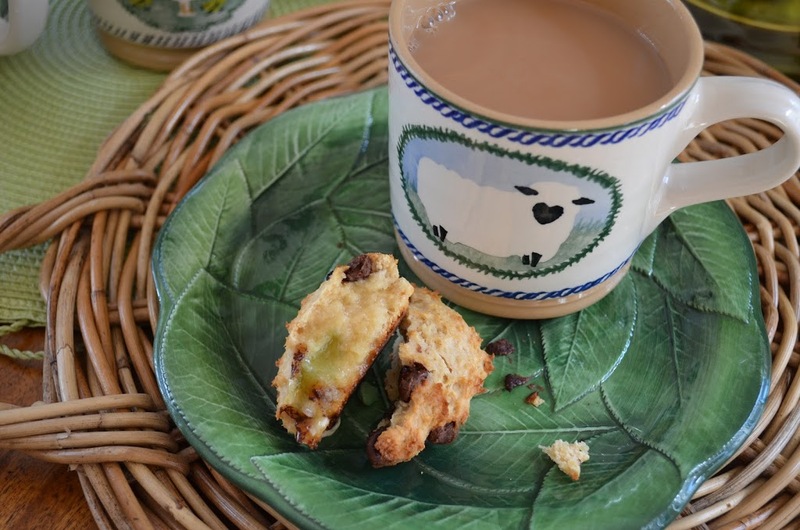 Scones are not the prettiest treat in the tea cart, but, oh, they are sooo good! I saw a picture of Catherine, the Duchess of Cambridge wearing a little posy made from shamrocks. I thought it was so very charming! What a fun story! You and your fancy French! I love the green too and it looks so pretty with your shamrocks. I am going to have to find some Kerrygold! It melted me just to see it on the scone! You just made me laugh right out loud with the story of Williamsburg. That’s too cute. I’m glad you stopped by because you are NOT coming up on my dashboard as having updated. I didn’t even know you were back in swing. So excited to see it, and I love your whole cloche… um… bell glass… post. I’m going to hit “follow” again to see if that makes you update.